Who hasn't lost their keys? If you are like most people, you've probably done this, and had it happen several different times. There is nothing more frustrating than when you are running late, trying to get out the door and as you are about to step out of the house realize you don't have your keys on you, and you have no idea where they are! Let's face it, many of us don't bother having one of those little hangers for our keys, you know the kind where you are supposed to hang your keys up on as soon as you walk through the door? Even if you do, many still neglect to use it, so it is inevitable that your keys will get lost from time to time. That is why here at Consumer's Survey, we were on the lookout for a handy device that we might actually use to help us find those lost keys. That is when we ran across the Click n' Dig Finder. We scanned hundreds of different reviews on the product first and foremost, seeing many positive reviews, plus some not so satisfied customers. However, we were still determined to try it out for ourselves, so we went ahead and ordered the product. This wallet, key and remote finder is convenient and of high quality that works to help you find your keys and other various items that get lost easily. It comes with six brightly colored receivers, and will beep to the correct device every time. All you need to do is hold down the color coded button on the radio transmitter, then you will hear a beep which corresponds up to sixty feet away, even through walls and under pillows. This is because the radio frequency can penetrate through these surfaces and others. 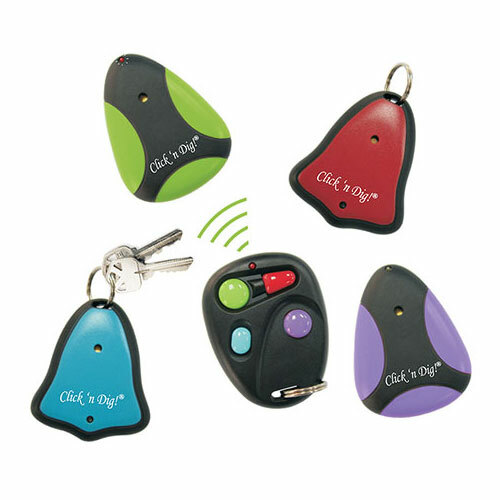 You will also be able to find your keys, remote, cell phone, wallet or other items when you use this little Click n' Dig Finder. Comes with six stylish and brightly colored receivers; three flat receivers and three key ring shaped receivers. All receivers have a flashing LED light. This model is new and improved with a smaller size and sturdier built, plus brighter colors. The RF transmitter also has corresponding brightly colored buttons. Comes with a twelve month warranty, including the batteries. Having plenty of avid losers of keys and cellphones here at Consumer's Survey, we are quite pleased with how well this product has worked for us. It didn't take us long to be able to test it out, because sure enough some keys were lost! Using the transmitter, we were able to hear a faint beep, beep. Following the sound and continuing to press the corresponding button on the receiver periodically, the beeping got louder and the keys were found where they had slipped down between things. They would likely have not been found any other way, or it sure would have taken some days to find them. This in itself has paid for the device. We do think that the transmitter for the Click n' Dig Finder could have been made a bit larger since this is the piece that you can just keep in a drawer or hang from a hook when not in use. It would also leave more room for labels or stickers to help identify the objects with the corresponding color code. It was nice that the unit came with extra batteries, however finding the kind that it takes is a fairly easy task as well, so there is no worry about having to replace them when needed.